This time every year, without fail, I start daydreaming of tropical climates with a piña colada in hand. And more so this year after Blizzard Jonas made it's appearance. Luckily, we've had some rain and so most of the snow has melted. Don't get me wrong, snow is pretty but after a week has gone by, it starts looking dirty & gross and I just want it to go away ASAP. We found out that Steve won a trip to Puerto Rico from work and so we're in the midst of figuring out if it's safe to go with the girls. With the Zika virus happening, it just makes us a little nervous since we don't know much about it in terms of transmission through breastmilk and all of that. Really, I just need to call the pediatrician and see what they say about it all. Anywho, when we found out he won the trip (we went last year and had THE best time!) 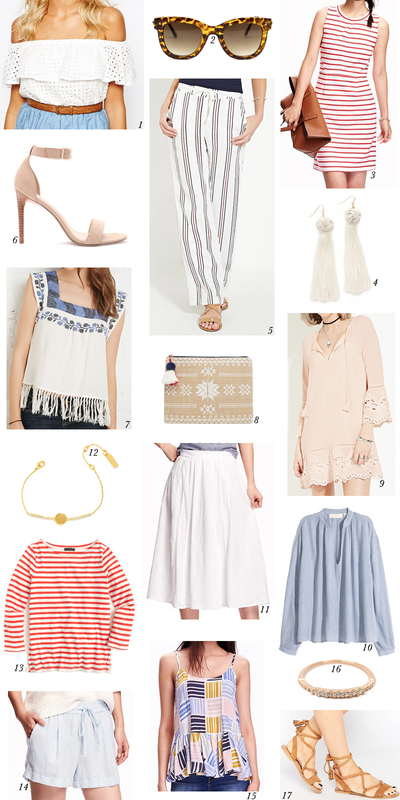 we started dreaming of how we'd spend the days there and of course I started conjuring up outfits I would pack for me and the girls. And that's how this board was created. If I'm being honest, I had found a lot of these items even before we found out about the trip. Guess, I really had warmer climates on the brain, eh? Well, the best part about everything above is that it's all under $50!! Doesn't get much better than that. So who's going shopping with me?